With a Chevrolet Corvette C5-R in the garage back home, 2006 was already looking like a year to remember for Luc Alphand. A win in one of the world’s most demanding motorsport events is now already on his career record, with a fine victory for Mitsubishi in the Paris Dakar Rally - a well earned single step up on the podium, after a second place finish last year. 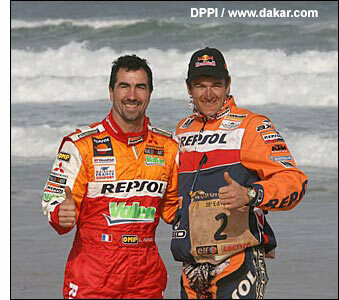 Alphand is pictured with motorcycle winner Marc Coma. It was by no means a walkover for the ex-skiing champion though: it was only after a substantial delay for Mitsubishi team leader Stephane Peterhansel that the pressure came off Alphand, and he then drove away from the opposition (which included the impressive VW factory backed Touareg team) in his Pajero rally raid special. 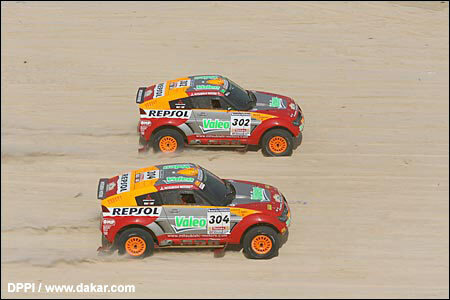 In taking the win he eclipsed an array of talent, both the experienced Rally Raid brigade and the likes of Carlos Sainz, Phillippe Gache and Henri Pescarolo, all of whom showed well early on, but faded later in the event. It was sadly an event once again tainted by tragedy, with motorcycle competitor Andy Caldecott and young local spectators Boubacar Diallo and Mohamed N'Daw joining the list of names who have joined the sad roll call of victims of this challenging but dangerous event. Alphand’s fine win is unlikely to harm his hopes of gaining an entry at the Le Mans 24 Hours.